Live Photo was first introduced by Apple on its iPhone 6s, which is a video-like image with sound, but now it has become a popular feature that many Andorid phones possess such as Huawei P20, Vivo X9, etc. But similarly, Android Live Photos still cannot be shared to others via iMessage, Facebook, Twitter, etc. just like iPhone live pictures. Fortunately, Joyoshare LivePhoto Converter is here to help you easily convert Android Live Photos to shareable GIFs or other still common formats such as JPG, PNG, BMP, etc. Next you'll see the detailed instruction in this post. So far, Joyoshare LivePhoto Converter for Windows (or Joyoshare Mac LivePhoto Converter) is the only and also the best desktop Live Photo converting tool to quickly convert any Live Photo to other popular image formats like GIF, JPEG, PNG, BMP, TIFF, WEBP, etc. in high quality on PC or Mac. Not only Live Photos from iPhone 6s and later new iPhones, but also live pictures from Android phones like Samsung, Huawei, HTC, Vivo and other devices can be converted and edited as you like. Specific speaking, Joyoshare LivePhoto Converter can convert one Live Photo or multiple ones in batch, you can also extract one or more frames from a Live Photo file according to your needs. Before converting, you're also allowed to play the Live Photos, preview dozens of still images in real time, and select the ones you need. 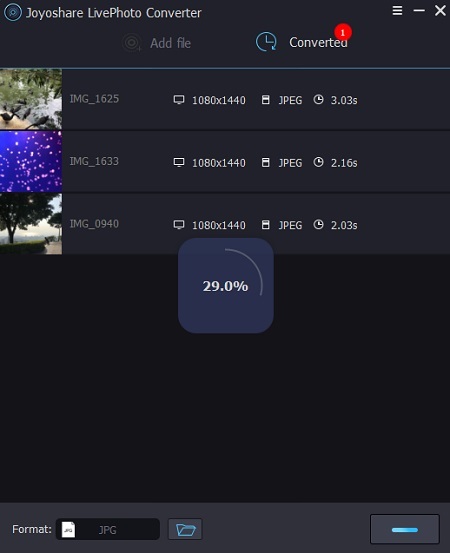 Additionally, Joyoshare Live Photo app for Android offers you a chance to set your preference such as adjusting the output quality, keep the original aspect ratio or not, etc. In the following paragraphs, we will discuss how to convert Android Live Photos to shareable and common image formats like GIF, PNG, JPG, and more on PC with Joyoshare LivePhoto Converter for Windows (Joyoshare LivePhoto Converter for Mac is also applicable). Before getting started, just go to the download page of Joyoshare and choose LivePhoto Converter to install it on your computer. Use an original USB cord to connect your Android phone to the computer, and then get the Live Photos you want to convert transferred to your PC. Simply launch Joyoshare LivePhoto Converter and then drag and drop the target Live Photo folder to the app. Alternatively, you can also click the "Add File" icon to find and locate these required pictures to the main interface of Joyoshare. Now play and preview all the Android Live Photos and tick the ones you want. You can also delete the files you don't want, and rename the pictures. 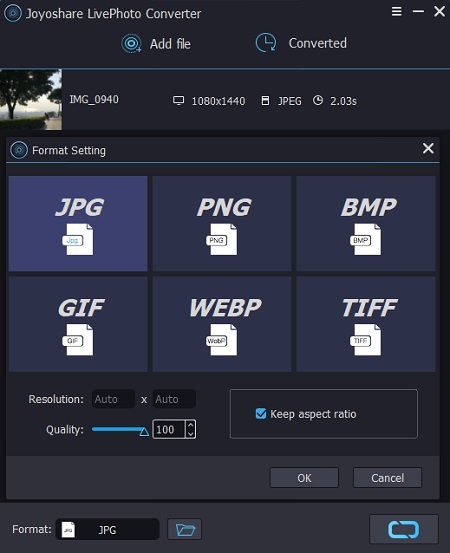 After that, press the "Format" panel to choose a satisfied output formats from JPG, PNG, BMP, GIF, WEBP, TIFF. Adjust the image quality by moving the slider or enter a specific value for resolution if you like. Once all settings are done, next click the "Convert" button at the lower right corner to begin to turn Android Live Photos to other format you desire. A few second later, you can press the "Converted" panel to find all converted files and then share them with your friends. 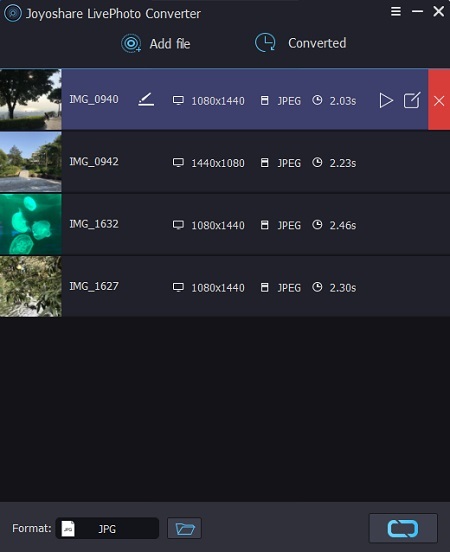 Export Live Photo as Video? Fixed!